I recently received 10 questions about cervical cancer in Zimbabwe from Rumbi Chakamba, a reporter for an online news service called News Deeply – Women and Girls Hub. Reporters play an important role in educating the public about cancer and other health concerns, and I answered the questions carefully. I thought they might also be helpful to others, so I’ve posted them below. Note: I have added additional comments in some cases. I’ve enclosed these in [brackets]. I welcome your comments on my replies. My thanks to Rumbi Chakamba for the opportunity to answer these questions. Can you give us an overview of the disease burden in Zimbabwe? Is your organisation involved in any programs aimed at early detection, treatment and education? Would you say such programs have been effective? What challenges do you face when tackling the problem of cervical cancer? Which health facilities currently offer cervical cancer screening and treatment services? Are such services easily available to all women especially those in the rural areas? Would you say enough is being done to educate women on cervical cancer? What more should be done to tackle the disease? Is there any other information you would like our readers to know? 1. Can you give us an overview of the disease burden in Zimbabwe? These estimates are for 2012, the latest figures available. 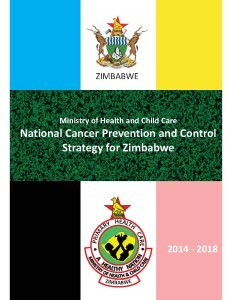 Cervical cancer ranks as the 1st leading cause of female cancer in Zimbabwe (this is when considering women of all ages). 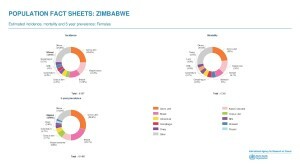 It accounts for 25% of all cancer cases and about 23% of cancer deaths among women in Zimbabwe. Cervical cancer is the 2th most common female cancer in women aged 15 to 44 years in Zimbabwe. View the fact sheet from the International Agency for Research on Cancer (a WHO agency) here or see it online: fact sheet. 2. Why is this so high? Cervical cancer is caused by human papilloma virus (HPV) infection. HPV is a common infection among both men and women. Long-term use [five years or more] of hormonal contraceptives [is associated with an increased risk of cervical cancer. When a woman stops taking hormonal contraceptives, the risk gradually declines.] See the U.S. National Cancer Institute article Oral Contraceptives and Cancer Risk. HIV infection is perhaps the most serious and known cofactor because it damages and eventually destroys the immune system. This leaves the body far less able to control HPV. Are there any programs that your organisation is involved aimed at early detection, treatment and education? The cells can be removed using one of several techniques, and one often used is to freeze them, a method called cryotherapy. Killing or removing these precancerous cells prevents them from progressing to cervical cancer. Our organization, Better Healthcare for Africa (BHA), working with Dr Lowell Schnipper, an oncologist at Beth Israel Deaconess Medical Center and Harvard Medical School in the U.S.A., supports a VIAC program at St. Albert’s Mission Hospital and at Karanda Mission Hospital. BHA also helps these hospitals provide community cancer awareness and education programs. For HIV-positive women: they should take antiretroviral drugs regularly as prescribed. This will help keep their immune system strong. The immune system is important for controlling HPV in the body (for most women, the immune system eliminates an HPV infection). The immune system also plays an important role controlling cancer. Yes, VIA screening programs have been effective. This screening method is endorsed by the World Health Organization for low-resource countries [read the WHO report here or click on the image], and they have been used in India and studies have shown that they reduce the incidence of cervical cancer. VIAC screening further contributes to women’s health because it finds noncancerous conditions such as schistosomasis infection or cervicitis, an inflammation of the cervix that can have several causes but is important to treat. For example, cervicitis might make a woman more susceptible to infection by HIV. 5. What challenges do you face when tackling the problem of cervical cancer? 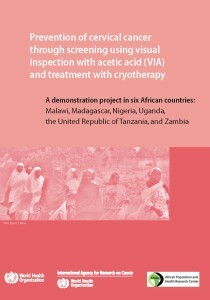 VIAC screening also identifies women who have cervical cancer, and few treatment options are available for these women. Drugs to control pain (an area of medicine called palliative care) for women and men with advanced cancer or other chronic diseases are often in short supply in Zimbabwe, including morphine. The most effective way to prevent cervical cancer is by using the HPV vaccine. The vaccine is most effective when given to girl and boy children age 12, before they become sexually active, but it can also help women into their 20s, also. 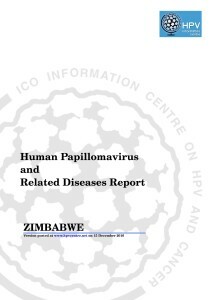 It would be helpful if women in Zimbabwe could be tested for the presence of HPV. It involves taking a swab of cervical cells and sending them off to be analyzed for the presence of HPV DNA. If the test is negative, it means the women is not infected with HPV and does not require VIAC screening. (She should consider retesting or VIAC screening in three years.) If the woman does test positive, she does have an HPV infection and should be followed by VIAC. I believe all government hospitals offer VIAC screening, though there may be exceptions due to economic circumstances. Screening is also available at St Albert’s and Karanda Mission Hospitals. I do not know if it is offered at other mission hospitals. 7. Are such services easily available to all women especially those in the rural areas? I think the Ministry of Health and Child Care is trying to make VIAC screening widely available but the Ministry is constrained by the nation’s economic challenges. NGOs such as BHA are contributing as they can. Cancer education of women – and of men, teens and young adults — is an ongoing task. Community education is critical to encourage women to get screened. It is also important for eliminating stigma. Stigma and shame can prevent women from seeking screening and treatment early, when cancer is most readily and successfully treated and sometimes cured, and when care is less costly. Stigma can also prevent a woman from going to a doctor after she finds a change in one of her breasts, a lump or change in shape. Local beliefs that a woman is less of a person because surgery has removed her uterus or a breast is another form of stigma that must be countered. Coping with cancer is difficult enough without additional suffering inflicted by ridicule, shame or embarrassment. 9. What more should be done to tackle the disease? See my replies to questions 5 and 8. And perhaps writing more stories like this one to educate people about cancer and the importance of compassion and emotional support for the person with cancer and her or his family. 10. Is there any other information you would like our readers to know? I would again encourage everyone to work to end the stigma of cancer, particularly cervical, breast and uterine cancers. A woman may notice a change in her body or a flow of blood that frightens her and may make her believe she has cervical or uterine cancer, or she might feel a change in her breast, but stigma within the family or her community may keep her from going to the doctor until the disease becomes far more serious. Last, I work at The Ohio State University Comprehensive Cancer Center – James Cancer Hospital and Solove Research Institute, which offers a free online course about the science of cancer called Introduction to the Science of Cancer. It is available on iTune U to anyone with an internet connection. Go to go.osu.edu/scienceofcancer. To access the course, you will need a free Apple ID and the free iTunes app on your computer, tablet or phone. Thank you, Ms.Tom – Yes, many women — and men! — lack facts on cervical cancer. It is a very preventable cancer if caught early. VIAC screening can catch changes on the cervix before they become cancerous and those changed cells can be removed. Their removal will likely prevent the cancer.